Affirmative Computer Products designs, develops and supports display and printer products for use with IBM AS/400, S/3X and 3270 systems that significantly reduce the Total Cost of Ownership (TCO) for our customers. These products are reliable and cost effective solutions, backed up by superior support and prompt service. Affirmative's motto reflects the positive attitude of their employees, who like to say: The Answer is YES! Affirmative offers Thin Client and TCP/IP Terminals for the IBM iSeries AS/400 and zSeries 3270 environments as well as true terminal style layout keyboards for Thin Client Terminals, Twinax Terminals an PCs. The well received YEStation Mini Model 2242 and 2252 Thin Client Terminals have been replaced with the more robust and fully featured YEStation Max III Model 2732. It has a faster processor, gigabit Ethernet connectivity, widescreen video support and a complete array of legacy ports including a Parallel Printer Port. With the optional mounting kit the 2732 can be attached to your monitor or even to the wall when desktop "real estate" is scarce. With 122-key keyboard support, it continues Affirmative's continued commitment to the IBM iSeries and Mainframe environments. Click here or on the photo above for more information on the YEStation MAX III Thin Client Terminal. Keyboard products that improve productivity are PC and Thin Client Terminal Keyboards with 122-Keys and 24 Command Keys. No operator re-training (or the resultant errors!) is required when a user moves from a "dumb" terminal to a PC. Replacement 122-key keyboards for Twinax Terminals for selected models of IBM, Decision Data, CLI and I-O Twinax terminals will extend the financial life of these corporate assets. See complete list of ALL Affirmative Keyboards by clicking here. The YESstation Mini Model 2252 iSeries AS/400 & 3270 Thin Client Terminal - Windows CE.NET and Linux based terminal with Citrix Metaframe & Winframe, Windows NT Terminal Server and Windows 2000 Server Support and full 122-Key 24 Command Key Keyboards. The YESstation MAX III - 2700 Series - i5, iSereis AS/400 & 3270 Thin Client Terminal - A powerful Family of Thin Client Terminals with WES7 , CE.NET6, and Linux models. The YEStation 2320 and 2700 Series are customizable to handle your applications. Support for standard PC and full 122-Key 24 Command Key Keyboards. 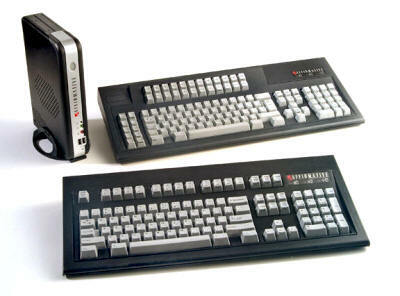 PC Keyboards Complete with 5250 Legends - The normal 102-Key keyboard labeled with complete AS/400 keyboard functions. No confusion for your users on what PC key equals which AS/400 function.